Put the yeast, sugar and Pomora extra virgin olive oil in a bowl and add the warm water. Leave for 10 minutes for the yeast to activate. Put the flour and salt into a large bowl and make a well in the centre of the flour. Add the yeast mixture to the well and mix until you have a dough. Knead the dough for 5 minutes until it is stretchy and glossy then return to the bowl, cover with cling film and leave for an hour in a warm place to rise. Knead the dough again and roll out so that it forms a thin (3mm) base. Pre-heat your oven to its maximum temperature and place your baking tray on the top shelf to get really hot. Place the pizza onto the hot baking tray and add your toppings. Mix the passata, basil and garlic together and then spread over the pizza base leaving a small gap around the edge. Bake in the oven for 12 minutes at 240 degrees Celcius until the base is crisp and golden and the egg is cooked through. Remove from the oven, add the spinach leaves and a splash more Pomora extra virgin olive oil and serve immediately. 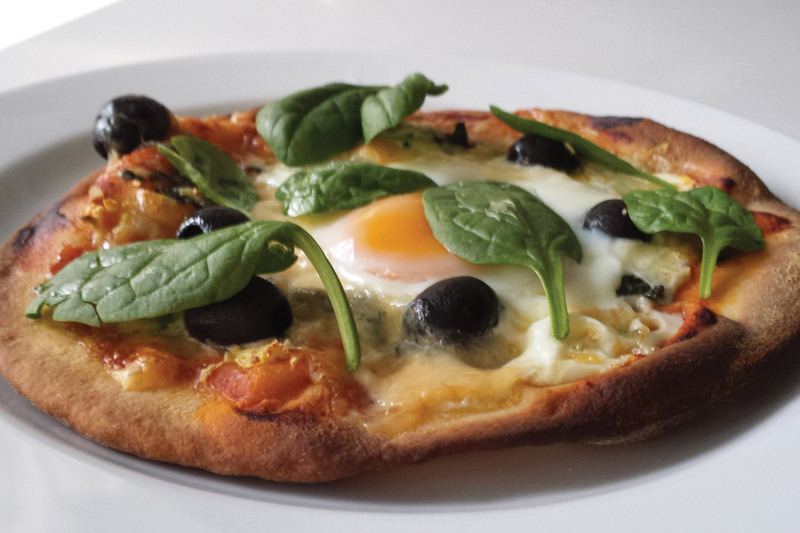 A classic pizza for the discerning palate!